Hacker [Dino Segovis] is back again with the fifth installment in his “Hack a Week” series. This time around he has put together a 1/2 watt audio amplifier that would make for a great weekend project. He’s a big fan of the LM386 amplifier chip because it does so much in such a small package. Since it is so versatile, he used it as the centerpiece of his Altoids tin amplifier. 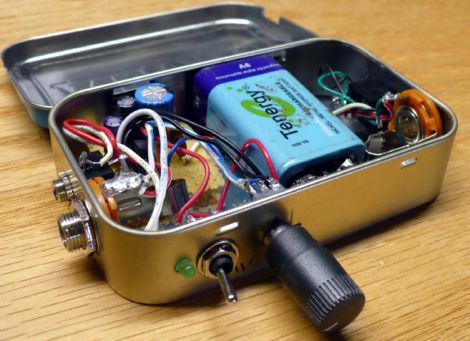 Now an audio amp inside an Altoids tin isn’t exactly a new concept, but [Dino] takes the time to discuss the circuit in detail, which is great for any beginners out there who are looking for a fun and relatively easy project. After a high-speed video of the assembly process he walks us through the completed amp, then treats us to a couple of short demos. One thing that makes his amp different than others we have seen in the past is the addition of a 1/4” guitar jack, which allows him to use his amplifier as a combo amp/distortion effect box. It’s another job well done, so be sure to keep reading if you’d like to watch the latest Hack a Week episode in its entirety. Dino is just too cool! Glad to see he got a scope, I’m sure he’ll make good use of it. Do those just amplify an audio signal? Like if i plug in my passive e-guitar, the output signal would be a clean guitar sound. If so: is it possible to build some sort of distortion/overdrive effect with those? @Nomad: Distortion is what this is all about… +1 on asking for a clean fuzz-less amplification. Anyone ideas on how to get clean sound out of a circuit with a footprint similar to this one? Nice project. I always fail when it comes to case mounting but yours was very clean an inspiring. Thanks for the “True RTA” software…I had never heard of it but now it’s in my toolkit. I’m becoming a bigger fan of Dino; definitely my favorite vBlog engineer now. So is this purely mono then? How would you go about making this stereo? two of them? How awesome to see this, I just finished my lm386 amp last week and put it into the same flavor altoids. I used two lm386’s for stereo output and skipped the potentiometer in favor of just using my ipod’s volume control and a switch (I kept bumping the pot when it was in my pocket,a mighty shock at times). Distortion occurs when the input signal is clipped. Consider an amplifier that is powered from a 9V DC power supply. The output signal from this amplifier can be anywhere from 0V to 9V (or there about, depending on the type of amplifier). The input signal from your guitar could be something small, say 50mV. The amplifier will increase this signal according to the amps “gain”. If the amp has a gain of 180, then an input of 50mV will result in an output of 9V. This would result in a clean signal, as the shape of the sine wave input will be the same as that being output. If however you increase the gain by more than 180, the amp will not be able to amplify the whole of the sine wave. Assume a gain of 200. 200 * 50mV is 10V, but the amplifier only has a 9V supply voltage, so this part of the sine wave will be “clipped”. Clipping of the sine wave is what is commonly referred to as distortion. A light distortion, like fuzz, will have very light clipping. So only the top part of the sine wave is clipped. A more heavy distortion will drive the signal very hard, creating almost a square wave. So basically, to make the signal “clean”, you just need to turn the gain of the amp down so that the output signal will be within the amps supply rail voltages. Needles to say you should find a suitable design in the LM386 datasheet. they run off 4x rechargable AA’s nicely and when plugged into good speakers they provide a nice rich (& suprisingly loud) sound, also bought the 10 watt version, the VMA2016 but haven’t gotten round to testing it yet – I assume from the 3 watt version sounding good that this will be very good with appropriate speakers. @smoker_dave: would it also be possible to output clean sound by turning down the input level? For instance with a pot? If so, then one could use a trimpot or a simple voltage divider with two resistors and set it up for maximum volume at low gain without clipping. Then it would be possible to crank up the gain and have some distortion. PS: i think i’m going to get myself some LM386. Or does anyone have better suggestions for similar amplifiers? I’m thinking of a preamp between my guitar and my home audio, so it won’t need to have a high wattage output. Never seen Altoids in the UK (although they are made in Wales?! ), anybody got any idea what the UK equivalent is? Trebor extra strong mints? (but they don’t normally come in a tin though). Hey! Are comments being moderated these days? No. It seems not, but my last three comments were eaten. Nomad, yes – if you decrease the input signal then it is the same effect as turning down the amp gain, or increasing the amps rail voltages. It would not be the optimal solution though, really you want as much of the original signal present as possible. The amplifier will introduce its own electrical noise into the output signal, and by decreasing the input this noise will be more apparent in the output. I just took a look at the LM386 data sheet (you can find it by searching Google). It turns out that the gain of the amp is determined by the resistor and capacitor values between pins 1 and 8. If you take a look at the data sheet, you will be able to work out what value resistor to put in there to turn the gain down. Personally I would not use a 741 in an audio project. Their non-linear characteristics make them sound awful. @smoker_dave: Would decreasing the input signal via resistor/voltage divider have the same effect that a simple pot in a guitar has if installed without caps/improperly? Like the loss of some frequencies or something like this. PS: Since i have more questions about this, i will start a thread in the forums later today. your 741 preamp would need dual supplies too, or if you design a dummy 1/2 supply point you limit o/p. Well, I don’t know what happened to my comments but I wanted to mention the Ruby guitar amp. Nice sound. Very easy to build. @Andrew: sir…you just made my day. This ruby site is awesome! You put the polarity on the 220uF but you’re using more electrolytic capacitors doesn’t the others have polarity? And.. Should I connect all the ground signs to the negative pole of the battery? Hi, has anyone created a stereo version of this amplifier? if so, please can they upload a schematic of their circuit? but its way too quiet. I was hoping to use this amp to made it loud enough for my purposes but when I pair it with the receiver from the laser communicator it wont work. Is the signal simply too small for the LM386 to amplify? In order to add the LED like Dino did, is there an extra resistor that needs to be added as well?